When people think about prenuptial agreements and asset protection during a divorce, items like the family home, bank accounts, vehicles, and jewelry are some of the first tangible things that come to mind. There are other items that some people forget, like retirement accounts and business ownership interests that also come into play. But, what about digital assets? Other digital assets may also have some financial value attached to them, like electronic accounts or intellectual property, shopping accounts, cryptocurrency, and more. Some of these digital assets may only be accessed through a website that requires a user name and password. Maintaining individual ownership certainly can be beneficial when deciding how to split these up. 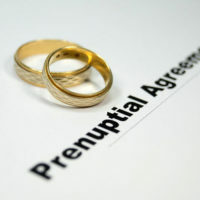 A prenuptial agreement can cover how digital assets are to be handled during the marriage and in the event of a divorce. It is beneficial to have an accurate assessment done of your digital assets. Any digital assets you enter into the prenuptial agreement should be spelled out in detail. In some cases, digital assets cannot be divided and there should be appropriate provisions in the prenuptial agreement to address these. Examples include an iTunes account, because it can’t be divided between two people. All files must remain on the same device. In your prenuptial agreement, you can discuss how the assets should be handled and what a breakup would mean. These assets are obviously more difficult to divide than CDs or DVDs, but the prenuptial agreement gives you the opportunity to discuss how to handle these items before a problem arises and you are fighting in a divorce hearing. You can opt for creative ways to maintain the assets during the marriage. Perhaps one spouse has control of the account and the other has access to it; the person who only has access would not be responsible for contributing to the cost of the service, etc. An online photo library is one digital asset that is often overlooked but can cause huge arguments during the divorce. If one spouse has access and decides to delete photos or lock the other spouse out during the divorce, it can cause additional arguments. Unless you’re a professional photographer, the importance of a photo library is sentimental. People store photos of their loved ones and their children as they grow up. Losing access to those because of a divorce can be devastating to a parent. Another option for addressing digital assets is through estate planning tools. This is an important topic not to overlook as you want to be sure someone has access in the event of your untimely death. You may want to have a list of accounts with user names and passwords that can be given to specific people named in your trust or will. Speaking with a Florida family law attorney can help you figure out the best way to protect your digital assets, whether it’s with a clause in your prenuptial agreement or through estate planning tools. Contact the Law Offices of Schwartz | White at 561-391-9943 to schedule a consultation.